Though the main topic of today’s post is in fact Fall sweaters like the title would indicate, we have ulterior motives with this one -- to get all of you guys to opt outside this Fall! Fall is our absolute favorite season for outdoor activity and that’s because we absolutely love the crisp, Fall air. Sure, summer’s great for hanging out outside and engaging in outdoor activity of all kinds, but Fall really gets our blood pumping. We’re major cool/cold weather lovers and getting outside in the cooler seasons just makes us feel alive, but that doesn’t mean we’re immune to the elements. In order to enjoy crisp temperatures as much as we want to, we have to layer up. And we love it because it lets us enjoy the great outdoors without being uncomfortably cold. Enter: the perfect Fall sweaters for men and women that will pull double duty for work, play and everything in between! You guys know by now that comfort, quality, versatility and price point are the things that guide our wardrobe choices and the seasonal staples we’re choosing to buy, and our sweaters are no exception. They have to be comfy/cozy, they have to be versatile and awesome enough that we’ll wear them from Fall to Winter, from the office to fly fishing and beyond and the price point has to be reasonable, though sweaters and jackets are the two garments that we’re willing to pay ever-so-slightly more for if they’re a really, really good investment. If it is a pricier piece, we have to know that we’ll get years, not months of wear out of them. Which is totally possible and something that’s the case with most of our sweaters and coats in our arsenal, especially since we live in a typically warm weather state. Chris is even less likely than I am to withstand a slightly scratchy sweater (I love throwing a soft long sleeved tissue tee underneath. C doesn’t love the extra bulk) and is extremely discerning when it comes to his sweater choices. He loves a good cotton crew neck style or a great chunky, rugged cardigan that he can just throw over his favorite tees, and both of those styles can pull double duty for him between work and play. If you’re shopping for your guy or dad or any man in your life and think that they could use a great sweater for the colder months, it’s always a good idea to choose a style that they can wear in pretty much any setting -- casual or at the office -- and a sharp crewneck that’s not too bulky or a nice cardigan are two awesome options for that kind of versatility. This super soft cotton crewneck sweater that C has on here is one of his all-time favorite sweater styles that J.Crew has been making for the last few years. It’s so soft, the perfect weight for chilly weather and layering and is such a flattering cut on anyone and everyone. It’s such an easy dress-up-dress-down piece, too. Bonus: it also comes in a ton of other great colors in addition to this charcoal color, too! C is also loving this super versatile cotton crewneck field sweater from J.Crew this year, this chunky cardigan, this super affordable, but equally awesome rugged cardigan, and this even more affordable oatmeal-colored classic. And I absolutely love a good, chunky cardigan. Super soft, oversized crewneck sweaters in pastel colorways are always a go-to for me, and I’m especially in love with this one, this one and this one this year, but cardigans are just so useful as a layering piece and I love the look of a chunky cardigan. There’s something so classic and cozy about them, and I fell in love with the J.Crew cardigan I’m wearing here at first sight! Actually, I first fell in love with the blush version because it has such a sweet, vintage vibe with the pointelle details, and the muted pink hue is one of my favorite colors right now, but I quickly realized that I would get tons of use out of the grey version, too. I love dressing it down and layering it over a super casual tee like the one I have one, especially on the weekends or for an outdoor adventure like fly fishing! It’s such a cozy, casual Fall combo that’s comfortable enough for all day wear and gives me the perfect amount of warmth to be outside all day in the crisp Fall air. I’m just really into a softer, cozier pastel Fall color palette this year, like blush and sage and oatmeal, so most of my favorite sweaters that I’ve seen fall into that color palette… and I love it! I think the same is true for my feelings about a Winter color palette this year… less black and navy, more sweet and soft. I’m loving this grey oversized v-neck because I feel like it’s the kind of staple you can wear anywhere, any way. And this super affordable pastel colorblock mock neck is just too good for words. And this gorgeous cardigan, though not exactly in the pastel category, has been in my cart for weeks because I feel like it’s the kind of thing you’d have for years and get so much wear out of. Also on a random side note, can anyone else out there just not do merino wool? I’ve tried and tried for years, but… the sweat is real! I feel like it’s just not a breathable fabric, it’s not really even that comfortable and that merino mixed with sweat is a deadly combo. Or maybe it’s merino mixed with deodorant? I don’t know, guys. That may be TMI, but I feel like it needs to be said! I’ve tried, people. I’ve really tried. If you have any insight about how to wear merino successfully, drop me a comment because I'm all ears. I need to know the inside info here! 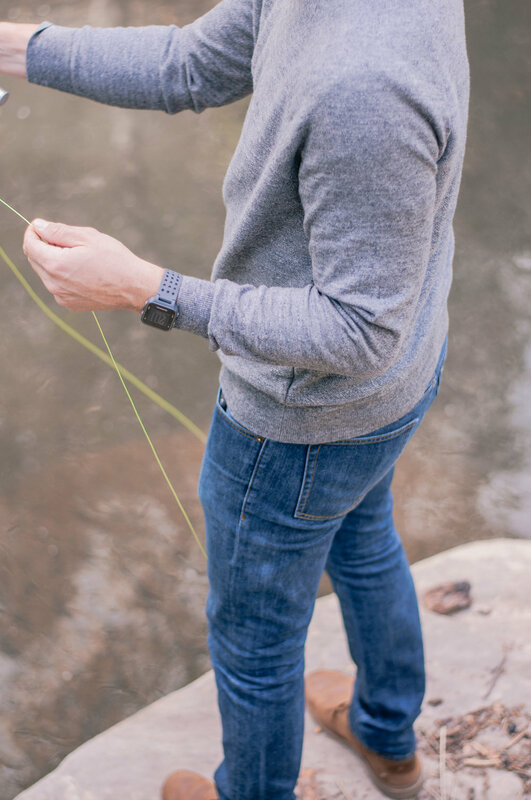 It’s not quite cool enough in Phoenix just yet (well, during the day at least) to rock a sweater, but it was 50 degrees while we were up in Oak Creek fly fishing for the day last weekend, which definitely called for some layers. C actually threw off his sweater and jeans mid-day and threw on some shorts and a tee to get in the water and holy crow did it look cold. The dude wasn’t even shivering! I was doing enough shivering for the both of us just watching wade in that freezing cold water with his bare legs. Mountain man, I tell ya! The only way I was wading in that water was with some super thick socks on, my wellies and a whole lot of layers going on on top. So this is just us giving you that little nudge to find a sweater you love from the Shop widgets above and below, layer up and get out there and enjoy that refreshing Fall air. We’ll be high diving and clinking a glass of cider with you from afar!